Install Java, if you don't have it already. I use the official Java from Oracle, but the OpenJDK Java Runtime should be fine, too. Install it from e.g. the Ubuntu Software Center. Download the Android SDK which contains an Android device emulator. Unpack the downloaded file to somewhere of your liking, for instance on the Desktop, in your user directory, or whatever you prefer. 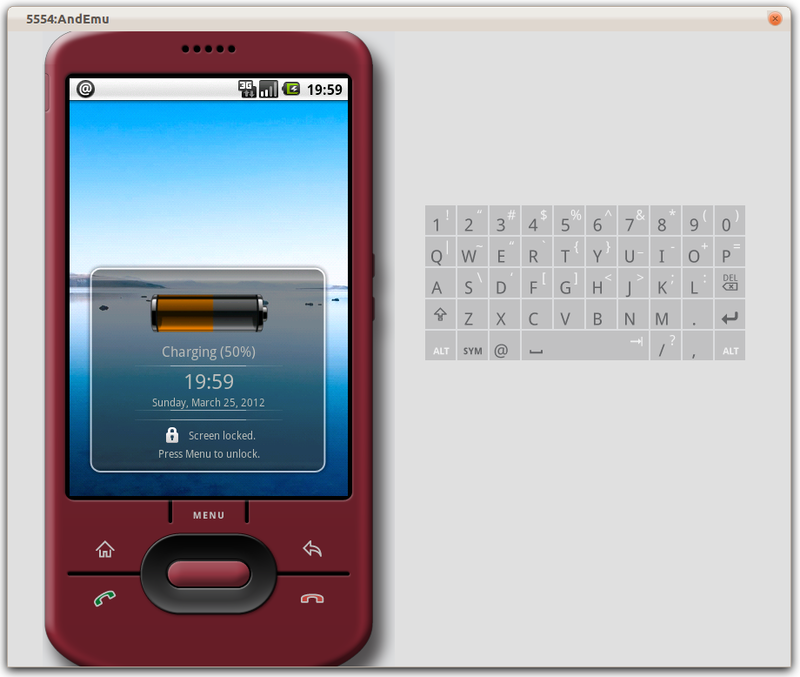 Go to the "tools" subdirectory, and start the "android" program by double-clicking it and selecting "Run". Tick the "Android 1.5 (API 3)" item (and thereby every subitem) and click "Install x packages..."
Accept licenses by clicking "Install", and wait a good while. 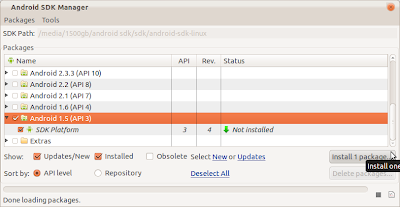 Then exit the Android SDK Manager. Go to Tech Droid and download the 1.5 image. in a terminal window, and you'll be able to extract it from your file manager. Copy the contents of the .rar file (a file and a directory) to ~/.android/avd/ (create the directory, if necessary). where "yourusername" is your system user name. Note, the line already shows a Windows path with backslashes (\), so make sure to only use forward slashes (/). Start the Android SDK Manager again (the "android" program in the "tools" directory of the Android SDK download). Select "Tools" and "Manage AVDs". Then select the "AndEmu" line. If it has an icon which implies that it's "repairable", click "Repair". Then start it by clicking the "Start" button, then "Launch". A virtual phone will now appear on your screen. Follow the instructions on the screen to complete the setup of the "phone". One of the steps is to connect it to your Google account (or create a new one), which is vital for connecting to Android Market. I had problems when I had to type in my details, since the Android system asked me to slide the phone open (and the emulator didn't seem to have a way to emulate this), so I chose "Skip" and then entered my details upon the first run of Android Market instead. Select the "Market" icon on the desktop of the emulated phone, search for your favourite app, and you're good to go. 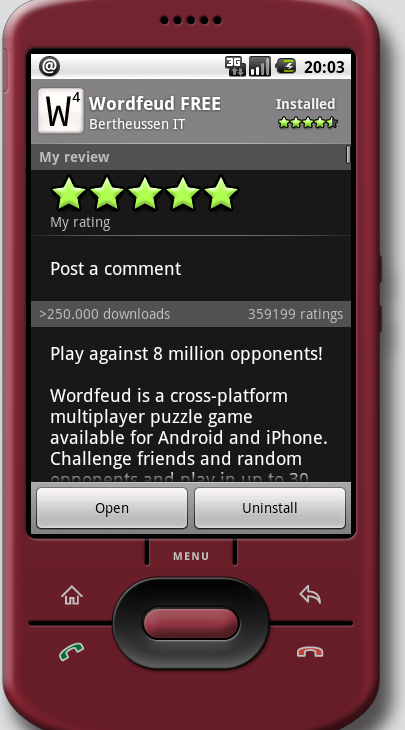 Are you able to download and install other apps through Google Play? Did you set up your Google account succesfully on the virtual phone? 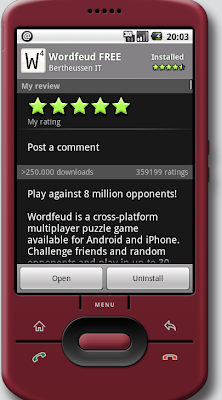 I try to install "wordfeud" on my laptop with running Ubuntu 12.04 LTS. After run "android" I see the error message. Unable to run 'adb': Cannot run program "/home/spidey-westland/Downloads/Android/adt-bundle-linux-x86_64/sdk/platform-tools/adb": java.io.IOException: error=2, Bestand of map bestaat niet. Hmm... I haven't seen that error before. Someone at http://goo.gl/1rzYp (StackOverflow) seems to have the same problem as you. Perhaps one of the answers there will help you? Or, perhaps the suggestion at http://goo.gl/9KYWg (also StackOverflow) will help (scroll down a bit on that page for a *nix answer)? Hope that helps! what is the correct location for creating this folder (going on the information in step 9 I'd say I got it right already, but I am desperate to play wordfeud and need to know)? Anyway, as for step 8: You're correct in creating the directory in your home directory. In fact, the ~ (tilde) is a shorthand for a user's home directory. 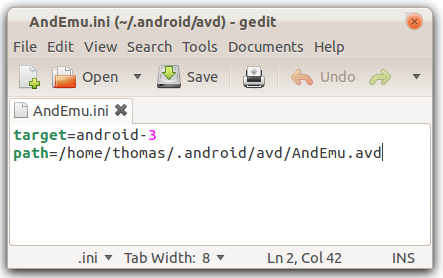 So, if you're logged in as user "paul" and you type the command "mkdir -p ~/.android/avd", you will create a new dir with the complete path /home/paul/.android/avd . 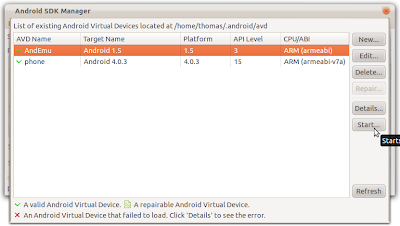 Remember to not only create a dir ".android" in your home dir, but also create a dir "avd" in the ".android" dir, and extract the files to the "avd" dir. I think the screenshot accompanying step 8 illustrates this well, if I'm still being unclear.